Lebanon, OH — Trace Tetrick recorded the 5,000th win of his outstanding career in the fourth race at Miami Valley Raceway on Sunday afternoon (April 14). He is the 116th driver in North America to hit that milestone. 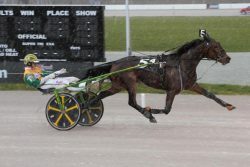 The 32-year-old green and gold clad reinsman, the younger brother of renowned driver Tim Tetrick, worked out a pocket ride for favored Harry Carry for three-quarters of a mile, then vacated the two-hole the final quarter to triumph in 1:57.1 during a brief but heavy downpour. The clocking represented a new lifetime mark for the winner in the non-winners of two races trotting event. Trace Tetrick collects his 5,000th victory Sunday at Miami Valley Raceway. Conrad photo. Tami Hartman trains Harry Carry, a 6-year-old son of Hard Rock N Roll, for owner Kenneth Appleman. Tetrick began his career in 2003, winning eight races and $12,418 in purses during his initial campaign. Since 2007, Trace has won a minimum of 250 races and over $1.5 million in purses in each of the last 12 seasons. In addition to his 5,000 wins, Tetrick has also earned over 4,000 place finishes and 3,500 show finishes. His best year to date was 2017 when he triumphed 569 times and his mounts made over $6.8 million. A seven-time dash title winner at Harrah’s Hoosier Park in Indiana, Tetrick also took the driving title at Miami Valley in 2017. Total purse earnings for his career recently surpassed $52 million.